Schumann’s Metronome Markings. A bother or a benefit? “You cannot define tempo. Tempo has no existence of its own, so it can be neither wrong nor right. What the world has not yet understood: tempo has noth ing to do with speed [...]. There is no singular tempo that you can take from Berlin to London [...]. Metronome marking ,92’. What is 92? [...] It is idiocy! Every concert hall, every piece, every movement has its own absolute tempo, defining exactly this situation – and no other.“ (From: Stenographische Umarmung. Sergiu Celibidache beim Wort genommen, Con Brio Verlag 2002). Now however, it undoubtedly applies that the character of a piece is quite decisively determined by the basic choice of tempo, regardless of the place of performance. A flowing basic tempo simply has a different effect than a halting one. For this reason the topic discussed in the Schumann Forum 2010 today will be of special interest to musicians. In accordance with our Urtext philosophy we regard the original metronome markings as crucially important and worthy of acknowledgment, and of course they are included in our editions. Thankfully the Schumann research centre Robert-Schumann-Forschungsstelle e. V. Düsseldorf collected all of Schumann’s metronome markings and provided us with a very useful overview (Schumann did not add metronome markings to all those works that do not appear in this list). Schumann’s metronome markings are at least as much subject to dispute in their validity and bindingness as Beethoven’s. We tend to regard some as too fast, others as much too slow. I am thoroughly convinced that it is worthwhile not to ignore these instructions, and that quite to the contrary, they afford a closer look. They are a benefit actually, and not a bother. (And should one still choose to play Schumann’s pieces in a distinctly different tempo than intended by the composer, at least it will be a conscious action). acknowledged articles in the past years. Dr. Struck would like to encourage musicians to take Schumann’s metronome markings more seriously, for they are neither wrong nor unplayable. Schumann (and his contemporaries) interpreted “slow” as a tempo much more fluent and in motion than we do today. Struck claims that in ignoring Schumann’s tempo instructions the musician is denying himself the opportunity to make an exciting new experience. In the phone interview (in German) I asked Dr. Struck the decisive and principal question about the correctness and authenticity of the Schumann’s metronome markings. 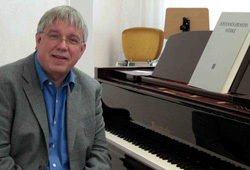 Michael Struck produced a radio broadcast on the subject of the metronome markings for one of the national German broadcasters (NDR; it was first broadcast on 11. November 2006; it is only available in German). He goes very deeply into the “Kinderszenen“ (and in the end plays a piece in its original tempo). With the kind permission of the NDR I am able to let you listen to an 11-minute clip of this highly recommendable recording. PS: Thank you very much for the many affirmative letters I received in response to my last contribution on Schumann’s birthday.